Three defensive errors were punished as City were beaten 3-0 at Hartlepool United last night. The Blues got off to the worst possible start conceding to a free header from Richie Barker after just three minutes. After weathering more home pressure City came back into the game well and should have drawn level only for Dean Bennett to see a shot from six yards saved by Dimitrios Konstantopoulos in the home goal after Paul Linwood’s goal-bound header had been cleared off the line. The Blues conceded again on 26 minutes with Andy Monkhouse left in far too much space at the back post converted from a Barker cross. City could count themselves unfortunate not to be level at the break, but things took a further turn for the worse when Phil Bolland was sent-off for a second yellow card on 69 minutes. The resulting free-kick saw Hartlepool seal the points with a third goal through Ben Clark. Following the game City manager Mark Wright said: “That wasn’t a 3-0 scoreline, and at half-time I felt we should have been in the lead because we had three or four good chances. I was pleased with a lot of what happened for us, which may sound double Dutch after a 3-0 defeat. Hartlepool are a good side, no doubt about that, but we paid for silly mistakes and were two down when we should have been in front. The sending off was a cruel decision and it changed the game in many respects but football is a cruel game. The Blues travel to Hartlepool for tonigth’s only League Two fixture looking to build on last weeks 2-0 home win over Barnet. City introduced three young players to the starting line-up against the Bees and it paid dividends to produce the best display for weeks. Against Hartlepool manager Mark Wright must decide whether to stick to last weeks winning formula or to bring in more experienced players who have failed to produce the goods in recent weeks. Paul Rutherford (left), Chris Holroyd and James Vaughan will all be keen to keep their place for what appears to be a hard task against the League Two leaders. Hartlepool will have two long term injured players, Joel Porter and Willie Boland, back in contention while City will be without Simon Marples. United have lost just once in their last 24 matches (in the FA Cup at Macclesfield), a great run that has seen them rise from mid table to five points clear at the top. The two sides last met in October when goals from the now departed Ashley Westwood and Jon Walters gave City a 2-1 victory. Tickets for the home match against Shrewsbury Town on Sunday 15 April (12.00) will go on sale at Deva Stadium next week. Season Ticket holders do not need a further ticket, however those who have Season Tickets in the West stand will be relocated, and compensated, as these seats are being given over to Shrewsbury. Tickets will go on sale from the club ticket office at the following times. Despite taking a two goal lead though Paul McManus and Alex Meechan the reserves were beaten 4-2 at Preston North End yesterday. Chester City: Palethorpe, Roberts, Newton, Allen (Gregory, 46), Kelly, Carroll (Morgan, 85), Rule, Cronin, McManus (Barnes, 88), Meehan, Smith. Subs not used: Vernon, Felliciello. The public smoking ban comes into effect at Deva Stadium on 2 April. From that day the club shop, executive club, social club and stadium, including stands and terraces will be smoke free. On-loan Midfielder Brad Maylett has been told he can choose whether to return to Boston United or stay at City for the remainder of the season. The Pilgrims have a serious injury crisis and have asked City for permission to recall the player who has scored one goal in 3+2 appearances for the Blues. Vandals have caused thousands of pounds worth of damage at Deva Stadium after apparently breaking into the ground on Sunday night and wrecking the toilet block on the Harry McNally Terrace. Toilets and sinks were smashed to pieces and piping was ripped out. Club officials found the devastation on Monday morning and CCTV footage shows two youths on bikes riding into the ground and entering the Harry McNally terrace. Anyone with information about the vandalism should call 0845 458 0000, or Crimestoppers anonymously on 0800 555 111. City recorded their first win in seven matches and as three of their younger players took to the field against Barnet and acquitted themselves well. Midfielder Paul Rutherford, making his League debut, had an outstanding game in midfield, Chris Holroyd making his second start set-up Jamie Hand for the second goal and there was also a League debut for James Vaughan in defence. Phil Bolland headed the Blues in front on the stroke of half-time with Jamie Hand drilling home the second on 58 minutes. The victory lifts the Blues to 13th in League Two and they are next in action on Friday night when they travel to table toppers Hartlepool United, kick-off 19:45hrs. Defender Simon Marples (left) misses tomorrow’s home League Two match against Barnet and may be out for up to a month after breaking a toe in training this week. Marples joins an injury list that already contains Royce Brownlie and Graham Allen who both have calf injuries and Dean Bennett who has a thigh injury. Should Bennett not be fit for tomorrow there could be a place in the starting line-up for Paul Rutherford. The Bees lie two places and one pont below City and will be looking for the double having beaten the Blues 1-0 at Underhill in October. 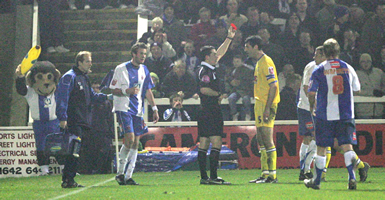 That game saw two controversial penalties awarded to the home side and after the referee was surrounded on two occasions the club were fined £1,000 by the FA and warned as to their future conduct after admitting a charge of failing to ensure its players conducted themselves in an orderly fashion. Once again Children aged 12 and under will be admitted free of charge in The West Stand if accompanied by a paying adult, this is on a one for one basis i.e. one free child with one paying adult, additional children will be charged £6.00. Tickets must be pre purchased from the ticket office. Tickets will be sold from 10.00 -16.00 today and tomorrow from 10.00 until kick-off. The reserve side lost at home 1-0 to Bury this afternoon in their latest Pontins Holiday League fixture. The Shakers’ winner coming two minutes from time. The football club have announced that their Annual General Meeting scheduled for 29 March has been postponed. A new date will be announced to shareholders as soon as possible. The Blues’ poor home run continued on Friday night as they conceded the only goal of the game through Louis Dodds after just four minutes and missed a number of chances late in the game to draw level. The match took place in front of another low Friday night crowd of 2,197 – of which 683 were Rochdale fans. This attendance is over 2,000 down on the corresponding Friday match last season. With just four goals and six points from the last eight home matches, four of which were against teams lower down the division, both manager and chairman are looking yet again to dip into the loan transfer market before Thursday’s deadline for another striker. With this latest defeat City dropped to 16th in League Two and will be looking to bounce back on Saturday when Barnet travel to Deva Stadium. Striker Simon Yeo has been passed fit to play against Rochdale tonight. He is joined up front by Royce Brownlie. Lee Steele and Chris Holroyd who started at Walsall are both relegated to the bench. City look likely to be without the services of Simon Yeo once again as they prepare to take on Rochdale tonight at Deva Stadium (kick-off 19:45). The striker who was injured in the game with Torquay United a fortnight ago is still receiving treatment on his injured ankle. Another doubt is Dean Bennett who limped off at Walsall last Saturday with a thigh injury. Visitors Rochdale have Nathan Stanton returning from suspension while defender Rory McArdle is also available after recovering from a knock. the Dale are currently 18th in the table, four points behind City but with two games in hand and are currently seven games unbeaten. 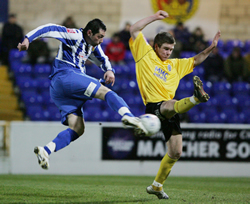 The two sides drew 0-0 when they last met at Spotland in October 2006. Chester are holding another “Kid’s For Free” offer for tonight’s game, with children under 12 years of age being admitted free of charge to the west stand if accompanied by a paying adult. Tickets must be pre-purchased and can be obtained from the Deva Stadium ticket office between 10.00 and kick-off. Additional children being charged £6.00 to get in. The reserves won their second game in succession as a Lee Steele goal after the break was enough to beat Blackpool 1-0 at Fleetwood Town’s ground last night. The Seasiders are currently second in the Pontins Holiday League Division One West with the Blues propping up the table. City suffered their third successive away defeat on Saturday losing 1-0 at promotion chasers Walsall. Once again the Blues had John Danby to thank for a couple of great saves that kept City in the game at times. However the best chance of the opening period was squandered by Lee Steele who blazed high and wide after being set-up by Chris Holroyd, making his first start in a City shirt. 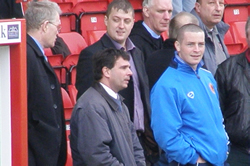 City’s record striker Stuart Rimmer, who went on to play for Walsall later in his career, was introduced to the crowd at half-time as part of a Coca-Cola promotion (above). The plans were going to be revealed at the club AGM at the end of the month but were leaked to the press yesterday. Some supporters may agree with the apparent disinterest from the council towards the club, but suggesting a name change as a possible way forward is clearly going to be met with fierce resistance from an already dwindling fan-base. Judging by the reaction of fans to the news that “section” is not as small as he may think! Defender Dave Artell could be back for the Blues tomorrow after missing the midweek 2-1 defeat at Mansfield Town with a head injury. The Blues have a tough task as they travel to make only their second appearance at Bescot Stadium to play second placed Walsall. Simon Yeo has returned to training this week following his Achilles injury but it may well be too soon for the striker to return. Walsall defenders Chris Westwood and Michael Dobson have returned to fitness, while striker Par Cederqvist could make the bench after a knee injury. The reserves won 3-0 at Tranmere Rovers this afternoon in a Pontins Holiday League Division One West fixture. The City goals came from Alex Meechan, Chris Holroyd and Francis Smith. Chester City: Palethorpe, J.Vaughan, Newton, Allen (Morgan 87), Kelly, Cronin, Smith (Barnes 78), Carroll (Rule 65), Holroyd, Meecham, Rutherford. Subs not used: Vernon, McManus. Tickets for the game at Walsall on Saturday can be pre-bought with a credit card from the Midlands club by phone saving £1.50 on the £18.00 admission price on the day. The ticket office is at 0870-442 0111 and tickets can be picked up prior to the kick-off at the Bescot Stadium Box Office. Last night’s 2-1 defeat at Mansfield Town finally killed off any lingering hope of making a play-off spot. Ten points adrift of the last play-off spot. The Blues took an early lead with a great goal from Brad Maylett, who had a good game playing wide on the right. However Billy Dearden’s side, who have beaten promotion hopefuls Lincoln and Wycombe in the last week, struck back to equalise before the break and grabbed the winning goal eight minutes from time. In between John Danby who was called on to block some thunderous shots at him. Defeat at Field Mill saw City drop to 14th place. The Blues follow this with a difficult match at second placed Walsall on Saturday. It will be only the second visit to Bescot Stadium the last occasion brought a 1-1 draw back in 1994. Striker Simon Yeo misses tonight’s League Two match at Mansfield Town after suffering an achilles injury against Torquay United on Friday night. Defender Dave Artell who received a knock to the head in the same game is expected to take to the field against his former club while fellow defender Simon Marples remains doubtful. Mansfield, managed by former Chester player Billy Dearden, welcome back on-loan striker Martin Gritton to the side that won 2-1 at promotion hopefuls Lincoln City on Saturday. The two sides last met at Deva Stadium in January with the points being shared following a 1-1 draw. The club have received a fine of £8,000 from the Football Association after the had admitted a breach of FA rule E20(a) – failing to ensure their players conducted themselves in an orderly fashion. The charge relates to the home game against Milton Keynes Dons last December. However, £5,000 of the fine has been suspended for 12 months. This is the third time this year the club have been found guilty of breaching the rule. In January they were fined £1,000 for the offence at Barnet back in October, and last month they were fined (along with Shrewsbury Town) £3,000 following the infamous mass brawl at the end of the match between the teams back in November at Gay Meadow. Chester were left to rue a string of missed chances as they were pegged back at the death by Torquay United at Deva Stadium on Friday night. The Blues had taken the lead after the break with Dean Bennett’s first goal in City colours. A harsh penalty in added time given after a Bennett challenge and Lee Thorpe shot home The Gulls’ only effort on target all night to the delight of their 155 travelling fans. City were forced into two changes in the opening period as first David Artell had to be replaced following an early head injury the Simon Yeo was forced off with an ankle injury just before the break and City continued with just one striker, new boy Royce Brownlie, holding the line. The Blues are next on action on Tuesday night when they play their rearranged game at Mansfield Town. The original fixture was postponed just before Christmas due to a frozen pitch. Kick-off at Field Mill is 19:45hrs. City are in action tonight when bottom club Torquay United visit Deva Stadium. It will mean a first return for Gulls coach Keith Curle following his departure from City last season. City may give a first start to youngster Chris Holroyd who has made 14 appearances from the bench this season and again impressed when he came on against Hereford United in midweek. Laurence Wilson is expected to have recovered but there are doubts over Simon Marples who missed the Hereford match after picking up an injury at Swindon. Both Brad Maylett and Royce Brownlie have now signed until the end of the season and may feature. Torquay recently appointed former City manager Keith Curle as their Head Coach to work alongside Colin Lee. The Gulls signed three players yesterday who, should the paperwork be completed on time, could feature tonight. They are goalkeeper Simon Rayner (Lincoln City), striker Dean Oliver (Sheffield United) and Blades defender Chris Robertson. Torquay are waiting on the fitness of strike pair Lee Thorpe (illness) and Jamal Easter (knee), but defender Stevland Angus is back after suffering a head injury. A last minute Roberto Martinez goal rescued a point for City at Plainmoor the last time two sides met back over the August Bank Holiday. All Match Day admission prices have been reduced by £2.00 for the match tonight. The following prices will apply. Children aged 12 and under will be admitted free of charge in The West Stand if accompanied by a paying adult, this is on a one for one basis i.e. one free child with one paying adult, additional children will be charged £4.00. Torquay fans tonight will be seated in the West Stand. Adult £15.00, Concession £10.00, Junior (U16) £4.00. Defender Ashley Westwood has completed his loan move to Swindon Town until the end of the season. 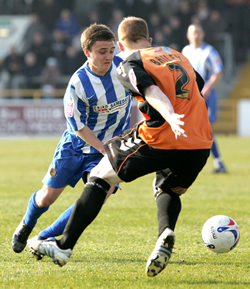 Joining Chester for the same period are Boston United midfielder Brad Maylett (pictured)and Swindon Town forward Royce Brownlie. 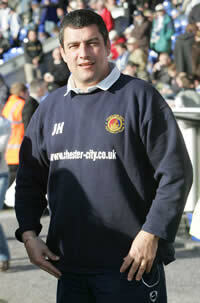 Youth team manager Jim Hackett has resigned from his position at Chester City. Simon Davies, the current Assistant Head of Youth is to replace Jim with immediate effect. This year has been a hugely successful one for the youth side who reached the last 16 of the FA Youth Cup, defeating Tottenham Hotspur 1-0 at Deva Stadium before losing at Bristol City. The side currently lie fourth in the North West Conference Group B, three points behind leaders Walsall and only last Saturday reached the Northern Area semi-final of the Youth Alliance Cup after a 3-2 defeat of Port Vale. Several youngsters have broken through to the first team ranks in the last couple of years notably Paul Rutherford, Chris Holroyd and, although he’s yet to make an appearance this season due to injury, Robert Marsh-Evans. The club are looking to make two more emergency signings ahead of Friday’s home game against Torquay United. They are 25 year-old Boston midfielder Brad Maylett and Swindon Town player Royce Brownlie. Maylett has made 3+11 appearances for the Pilgrims this season and has been a target of Mark Wright’s for some time. Australian-born Brownlie has scored two goals in 9+8 appearances with Swindon this season after joining then from Queensland Roar last summer. Both signings should be until the end of the season. It also looks like defender Ashley Westwood will be heading in the other direction to the County Ground on loan. The ISA are holding a Question of Football night at Deva Stadium on Thursday 8 March. Several ex-Chester players will be attending including Stuart Rimmer, Gary Bennett, Bob Delgado, Terry Owen, Brian Croft and Arthur Albiston. Others may join in as well. Admission is just £5.00, and only £4.00 for ISA members. 19.30 for 20.00 start. The evening will be chaired by Charlie Lambert. Why not try and get along it should be an entertaining night.